DPF and SCR in single unit positioned behind second front axle at the right-hand side of the chassis. 390 steel fuel tank, no spray suppression fitted. Chassis paint finished in Grey, AdBlue tank 45 litres at the left-hand side of the chassis. Front axles: tyre size 295/80R22.5, wheel size 22.5 x 8.25. Rear drive axles: tyre size 295/80R22.5, wheel size 22.5 x 8.25. Two front axles, type 167N. Vertical offset 20 mm. Normal parabolic leaf suspension with shock absorbers and stabiliser. Max. load 2 x 7.1 tonnes. Rear trapezium leaf suspension, double driven tandem axles type SR1132 with single reduction, Max. load 2 x 9.5 tonnes. Mechanical cross-axle and inter-axle differential locks. Day Cab with galvanized steel bumper, tinted glass and electric window openers. Main mirrors and wide angle mirrors electrically heated, cab width 2300 mm, mechanical cab suspension. Central door lock system with exterior light check function, remote locking, LED daytime running lights, translucent external sun visor, rear cab window. Front view mirror to comply with EC directive 2003/97/EC for frontal field of view. Electrical adjustment of the main mirrors and the wide angle mirrors. Daytime running lights with four LED's at each side, integrated in the head light units. Bi-reflector halogen head lights with impact-resistant Lexan lens. Head light levelling device. Head light beam for left-hand traffic. Bumper mounted light units with combined fog light and cornering light function. Robust first cab entrance step with EPDM rubber surround with anti-slip tread. Double glazed window in the cab rear wall. Telescopic windscreen wiper and ice scraper for easy cleaning of the windscreen and the side windows. Air suspended driver seat - Comfort Air. High backed seat. Upholstery Flash Copper for the seat facing, Thunder for the borders and Rustico for the edges. High backed basic, fixed co-driver seat. Upholstery Flash Copper for the seat facing, Thunder for the borders and Rustico for the edges. Storage box on the engine tunnel. Aluminium roof hatch with manual control. Cab climate control automatically controls cab temperature, blower, air distribution and air conditioning. Pollen filter with acivated carbon to eliminate traffic and engine blow-by gasses and odeurs. Effectiveness 85% for particles up to 0.5 micron and 98% for particles up to 10 micron. Converter 24V to 12V, 10A, 120W. Accessory power supply to the roof console 12V/20A and 2x 24V/15A. Speedometer with main scale in m/h and secondary scale in km/h. Speed limiter setting for cruise control/accelerator pedal: 90 km/h. Radio/USB player. Speaker system with 2 speakers. TruckPhone. Handsfree telephone kit with SIM card slot, Bluetooth antenna and two USB charging points. Multipoint-Pairing enables simultaneous operation of two additional mobile phones from the steering wheel. Standard antennas: AM/FM, GSM and GPS. Second GSM antenna for telephone. Cruise control. Includes Mild Cruise Control function to resume a set vehicle speed in the most fuel efficient way. Driver Performance Assistant (DPA). Interactive programme to support the driver in achieving the most cost effective driving style. The DPA information is shown on the 5 inch full colour TFT display in the instrument panel. The body is constructed out of durable and hardwearing pressed and folded Hardox 450, suitable for carrying muck-away, demolition rubble materials and aggregate. The sides are fixed and pressed from 4 mm Hardox along with the heavy duty top rails which are folded and also from Hardox this gives the body exceptional strength, the floor is a single 5 mm Hardox sheet with angled edges which meet the side walls to avoid a 90 degree angle which material can stick too. The bulkhead and top swung tailgate are also single skin pressed Hardox material. 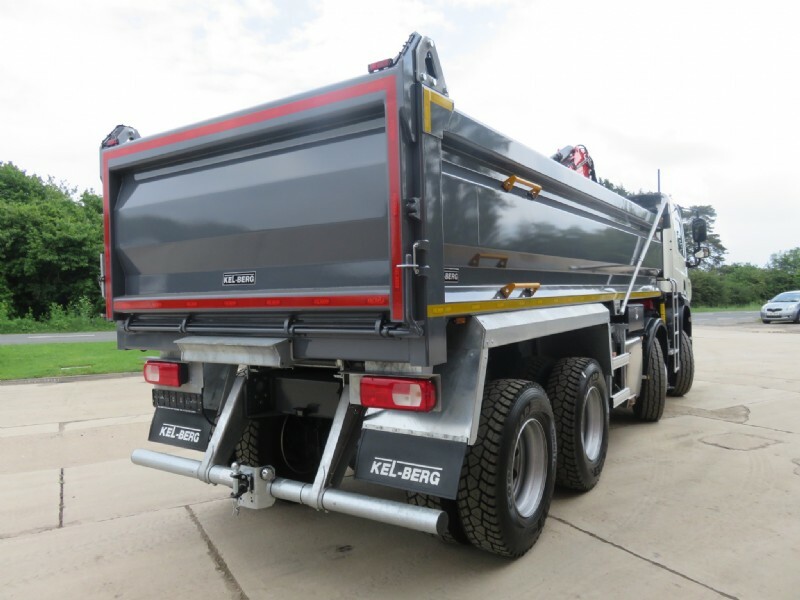 The mud wings, rear valances and heavy duty back light brackets are galvanised and bolted on so can be easily changed if damage, truck manufacturer rear lights to be used. EDBRO TS series. 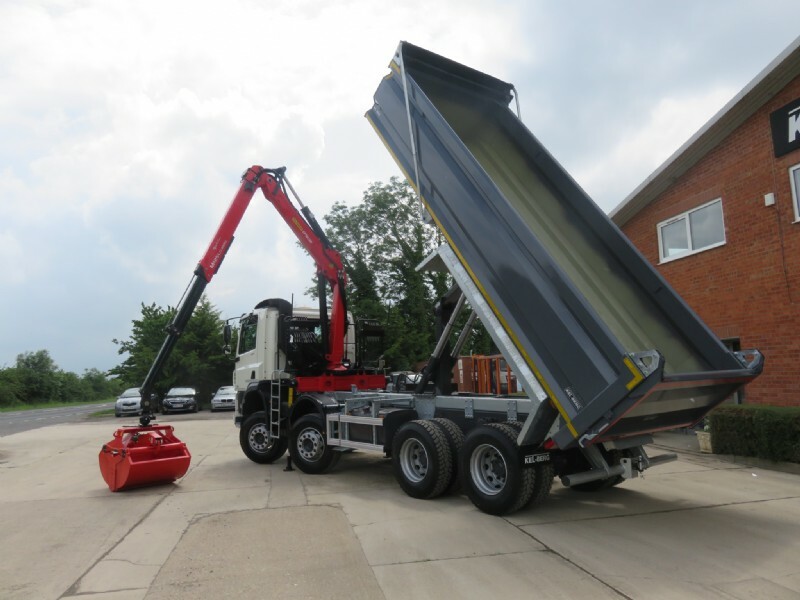 The high tensile steel stabilising frame within the TS effectively absorbs side loads imposed by the chassis during tipping whilst protecting the cylinders from side load. With 50% more torsional stiffness than comparable units, the TS provides ultimate stability for the safest tipping in even the most demanding operating conditions. Palfinger Epsilon M125 LC82 crane. Dual stand up controls with cable controls on drivers side. Double access catwalk and platform finished in black. Double boom extension with BK057 4.5t rotator, Kinshoffer KM602 500L clam bucket with lifting hooks, two fixed stabiliser legs, ground controls fitted to the off side. Main cylinder protection guard, rubber bump strip on outer boom. 2 spot lights, emergency stop & load hold valves on the main cylinder. Rated capacity indicator with LED for 50% 75% and 100%. Invisible safety case around the operator’s position. 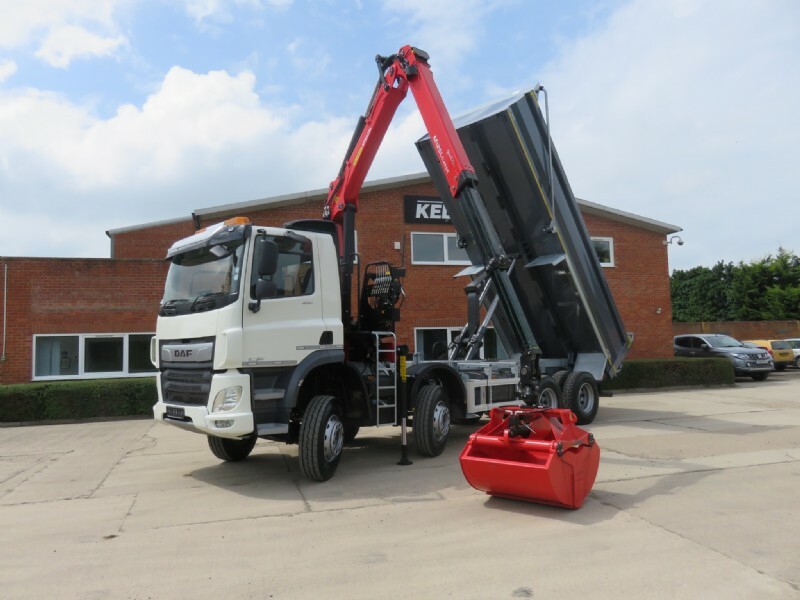 The crane is finished in KTL primer and painted in RAL 3020 red powder coating. The bolt together Kel-Berg sub frame is constructed from Strenx 700 MC. This high strength structural steel which has been developed for components in load-bearing structures whilst offering weight saving. This design allows a degree of flexibility within the sub-frame during its normal working duties, it is fully galvanised to ensure a long lasting durable installation. Two powder coated hand rails fitted to O/S of body near rear axle. Galvanised Parts; shovel rack mounted on front bulkhead, bolt on rear push bar, rear under run bumper, galvanised bolt on sheet roller cover prepared for sheet system, galvanised single piece ladders on passenger side, galvanised folding ladder on driver side. Body raised warning with in cab light and buzzer, conspicuity markings to be fitted to conform to current C & U regulations, side guards fitted to both sides of the vehicle on galvanised brackets. 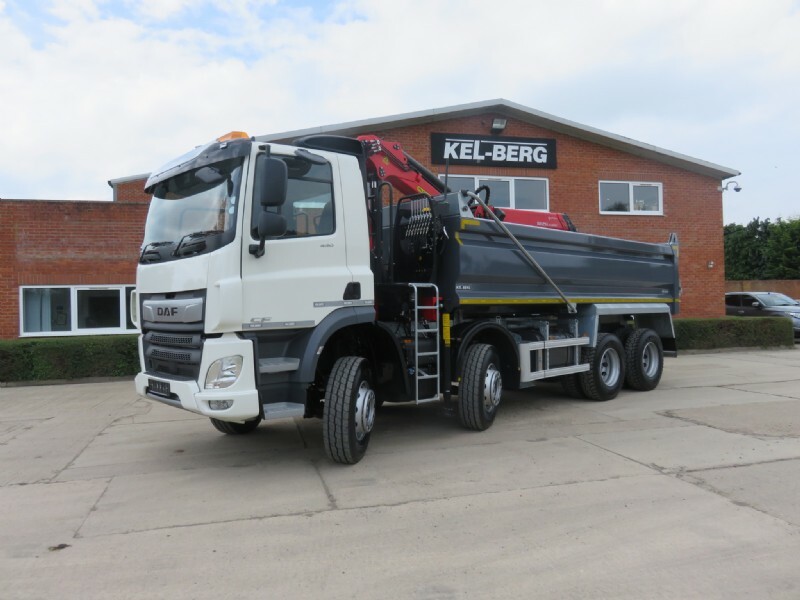 Chassis cab: Warranty Plus 2 Year Vehicle & 3 Year driveline - takes care of all warrantable repairs on the vehicle for two years and on the driveline for a third year together with associated breakdown coverage.